Nothing can put a damper on a camping trip then not being able to start a fire. Yes, I have tried many different types of fire starters. Some of these have been store bought and others I have made but there are times when you need to find something on the trail. This is where the birch tree comes into play. Believe it or not, the birch tree’s bark has oil in it that burns easily. This is a plus when you are trying to find a fire starter out in the backcountry. Before we move on, I would like to remind you that the bark from the birch is a natural resource and should only be harvested as needed. To begin the process, one will need to first collect the bark. This step is easy to do and only requires you to pull up the lifted pieces of bark. When doing this, do not create a ring around the tree. This will kill the tree and frankly you do not need that much. Once the bark is collected, you will need to store it away in your pack. When you are ready to start your fire, pull out your bark but………..do not just throw it into the fire. A big piece of bark will burn but the goal is to increase the temperature of the fire so that other pieces of wood will catch on fire. The best approach is to pull out your knife and begin shredding the bark. 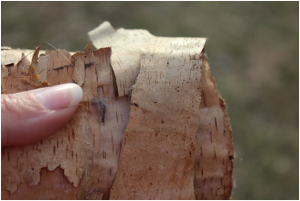 Believe it or not, a little will do you so if you plan to be out for awhile make sure to budget out your birch bark. After the bark has been shredded, light it and slowly begin to add small pieces of tinder. Continue to add wood to your fire as it heats up. Now you have a heat and safety. If you have collected your birch bark before your campout then you can properly dry it out. This process is easy. Once you have harvest your birch bark, go ahead and shred it up. Lay it outside to dry for a day or so. After the bark has dried out, store it in a plastic bag that is resealable and use as described previously. While I never encourage individuals to strip bark off of trees, there are a few times that this measure is needed. When harvesting your bark, always abide by any natural resource regulation that is in place for the location by which you are camping.